Building on the success of the REF2014 module which helped UK institutions streamline the submissions process for the Research Excellence Framework (REF 2014), Pure is increasing its support for Denmark's Bibliometric Research Indicator (BFI) and the Excellence in Research for Australia (ERA 2015) assessment in Australia. The release of part 1 of the BFI module and part 2 of the ERA module will both help customers track, monitor and manage the submission process for these strategically important assessment exercises, the results of which help to shape funding allocation decisions. Learn more about how Elsevier has supported these and other national assessment exercises in this Elsevier Connect article. 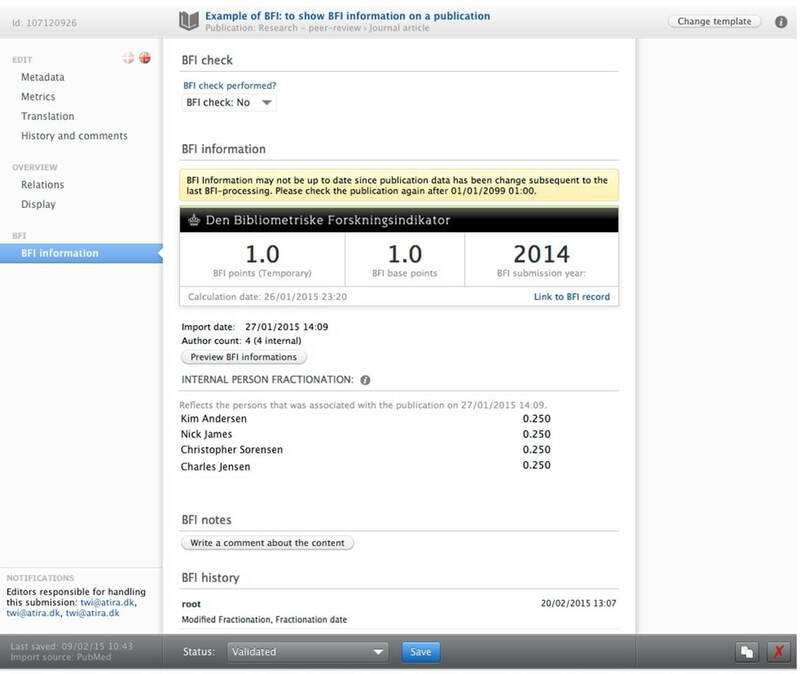 Get an at-a-glance view of how the BFI information is displayed for each publication, including whether the BFI data is up to date, and how the BFI points can be divided between the internal authors. The overview screen helps you keep track and monitor your ERA submissions progress. 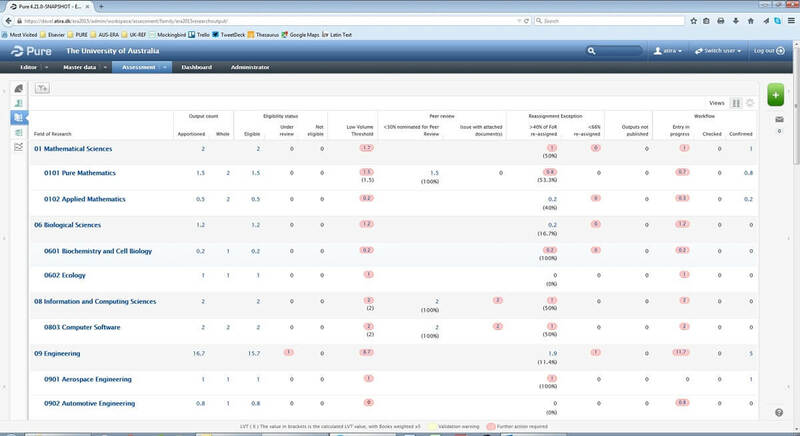 See an overview of your ERA content (i.e. research outputs) to determine what action, and on which records, is still required. Highlighted content (in RED) indicates that further action is required, or highlights an issue. Part of the Administration module, Pure supports the newest version of VIVO (1.6). By automatically transforming data within Pure into the VIVO ontology, VIVO can be easily populated with rich researcher content from your Pure system. And with Pure’s strict visibility rules, you can rest assured that confidential data remains confidential. A multitude of enhancements in how people are indexed and stored in Pure, makes it easier to find people and report on their profiles. Pure now allows an unlimited number of name and title variants for each person stored. That combined with the ability to add the full history of a researcher’s past positions and qualifications in Pure, gives users the ability to run more detailed reports on the people within the organization. The additional details also provide fuller researcher profiles in the public facing Pure Experts Portal. The next major Pure release is June 2015.